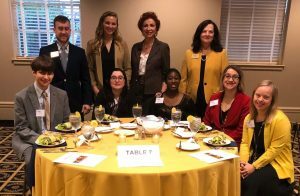 This Spring, I had the pleasure of being hired by The Denning Technology & Management Program, Scheller College of Business, at Georgia Institute of Technology to do two dining etiquette workshops for their students about the importance of networking and business dining etiquette. I was thrilled for the opportunity to help our future professionals learn networking and etiquette skills. Interacting with college students is one of the highlights of my profession. They are always so attentive and willing to learn new skills. We had fun learning how to properly hold a soup spoon as you can see in the image on the left. Rest assured there are now a few students entering the business world who know how to properly eat their soup! We put on two sessions and were joined, at the second one, by students and staff from GA Tech’s Excel Program. 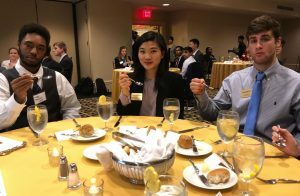 I agree with Anne that the “Excel students brought a level of enthusiasm to the event that was infectious . . .” The Excel Program is led by Director Ken Surdin and offers two- and four-year certificates for students with intellectual and developmental disabilities. Each session was held on campus at the Historic Academy of Medicine run by Shawn Stinson. The dining experience was catered by Time to Dine Chefs and Caterers, LLC.